Notes to the recipe: The original recipe, which can be found here , was made with honey, not maple syrup. I used maple syrup as I think it pairs better with cranberries, but you can, of course, use honey if that’s more convenient for you. I didn't want my granola to be very sweet, so I didn't use much sugar. Feel free to add more sugar if that suits your taste. 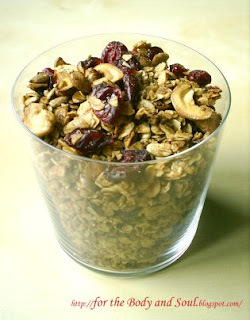 I like this granola most with plain soy milk, but you can have it with regular milk or yoghurt as well. 1. Preheat the oven to 180 C (350 F). 2. Combine all the ingredients, except for cranberries, in a large bowl. 3. Spread out on a cookie sheet. 4. Bake for about 20 minutes, stirring and turning occasionally, until toasty golden brown. 5. After baking, allow to cool thoroughly. Stir in the cranberries. Store in an airtight container or glass jar at room temperature.